Benchmarking app AnTuTu periodically releases rankings of new smartphones that have been benchmarked on the app. The latest ranking released from AnTuTu gives us a glimpse of the top 10 Android phones that have clocked big scores on the app, including the Nubia Red Magic Mars. AnTuTu’s benchmarking app is quite famous and we use it ourselves to benchmark the new Android smartphones in the market. The app tests different parameters on a smartphone to deliver a score which can be used to compare it with other smartphones. 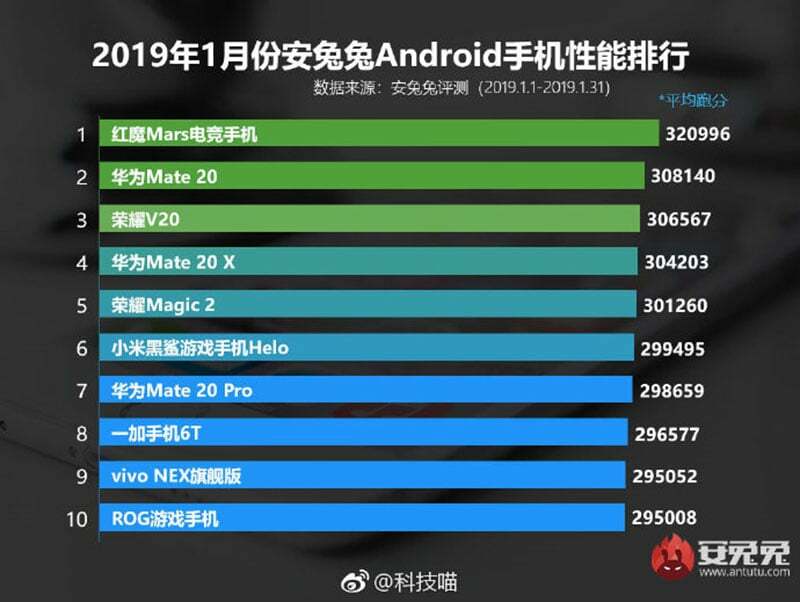 The latest January 2019 ranking released by AnTuTu on Weibo shows the Nubia Red Magic Mars at the top spot, retaining its position since December. The Nubia Red Magic Mars was first made available via a crowdfunding campaign but went on sale in China starting at a price of CNY 2,699 (roughly Rs. 27,400) for the 6GB RAM/ 64GB storage model. It also comes in an 8GB RAM/ 128GB storage variant priced at CNY 3,199 (roughly 32,500) and a 10GB RAM/ 256GB storage variant priced at CNY 3,999 (roughly Rs. 40,600). Powering the Nubia Red Magic Mars is the Snapdragon 845 SoC, which was Qualcomm’s flagship processor for 2018. Nubia’s Red Magic Mars had managed to beat the Huawei Mate 20 in December and the smartphone still holds the second spot in the January listing. The third spot goes to the Honor V20 aka the Honor View 20. The Huawei Mate 20 Pro₹ 69,990, which has the same internals as the Huawei Mate 20, is at the seventh spot behind the Honor Magic 2 and the Xiaomi Black Shark Helo. The OnePlus 6T₹ 37,999 is at the 8th spot, followed by the Vivo Nex S and the Asus ROG Phone. What is interesting is that out of the 10 smartphones, five are powered by the Qualcomm Snapdragon 845 SoC, whereas the other five are powered by the Huawei Kirin 980 SoC. It is worth noting that this list only contains phones that are officially available in the market. With Snapdragon 855 SoC powered smartphones expected in the market over the coming months, it’ll be interesting to see how this ranking changes.